Offices available for lease in a modern, furnished Tijuana business centre. The centre features secretarial and tech support, and the offices come in a range of sizes, and on flexible contract terms. 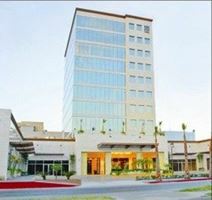 The centre is situated in the prestigious Zona Rio district of Tijuana. This prestigious sustainable serviced office facility is located in a well known business district, and boasts great transport links. A number of secure office spaces are available for immediate occupation, along with a full complement of business support services, as well as an impressive food court and restaurant.